Ok, yes. I want many things, but I especially want this new book from House Beautiful written by Jennifer Boles who also pens (keyboards?) the blog The Peak of Chic. 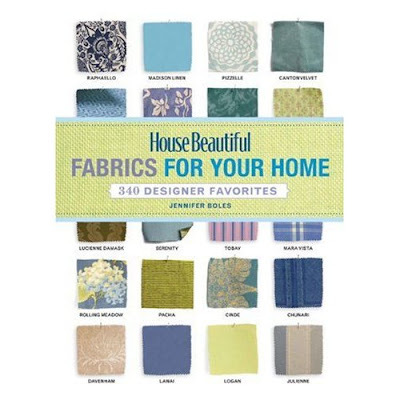 I have yet to get my hands on it, but from what I've read, it's a great little reference for all things fabric - patterns, textures, colorways and how they all harmonize together. I know fabric can be a bit daunting - there is SO much of it in a vast array of options...oh, but it can be your friend. I always turn to fabric for inspiration. If you've been trying to navigate the world of fabrics, I bet this little primer will go a long way in helping you decide what you do and don't like - and how to use the fabrics that catch your eye. Anyone already have it? What did you think?? I have ordered it and it is en route. I am planning a post on the Chinoiserie fabric picks-Jennifer loves Chinoiserie. I picked this up when I was at Barnes & Noble a few weeks ago...it's a quick read and they are some gorgeous fabrics featured, but I was hoping for a bit more guidance on various sources, price points as well as the types of fabric (linen, silk, tweeds) and which are best suited to various types of projects....Also, if you're a long time (or really just the past few years) reader of HB, a lot of this will be recycled for you.